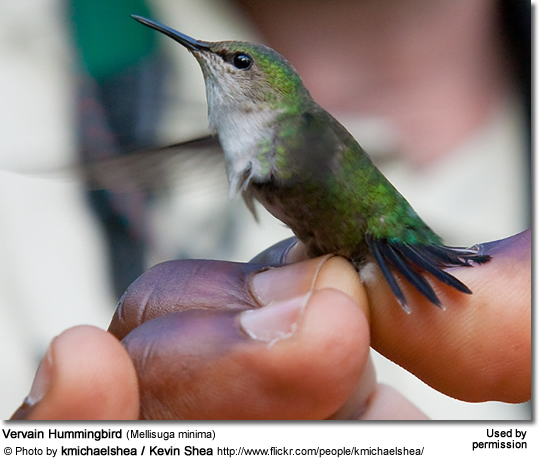 The average hummingbird measures about 3.5 - 4 inches (8.9 - 10 cm) and weighs about 0.106 ounces (3 grams). 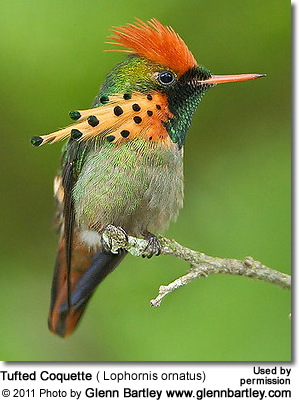 The smallest - the Bee Hummingbird of Cuba measures only 2 inches or 5 cm in length and weighs between 0.06 - 0.07 oz (1.8 - 2 g) - which is about the same size of a bee for which it was named. This is also the smallest living bird species on Earth. 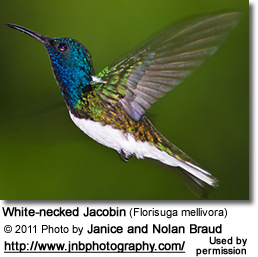 the largest - the Giant Hummingbird of South America is about 8 inches or 20 cm long and weighs about 0.70 oz or 20 grams. Male and Female Differences: In most species, the females are up to 25% larger in size than males, and their bills tends to be a little longer as well. 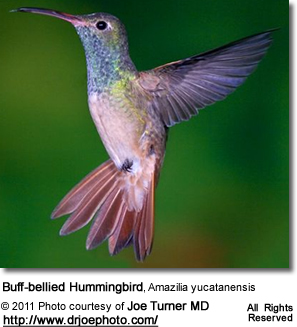 Bill and Tongue: Hummingbird bills are generally long and either straight or with a slight down-curve. Some hummingbird species have bill shapes that are specially adapted for the flowers that are found in their native range. For example, Thornbills have short, sharp bills adapted for flowers with short petals (corollas). Their sharp bills are then used to pierce the bases of longer blooms. 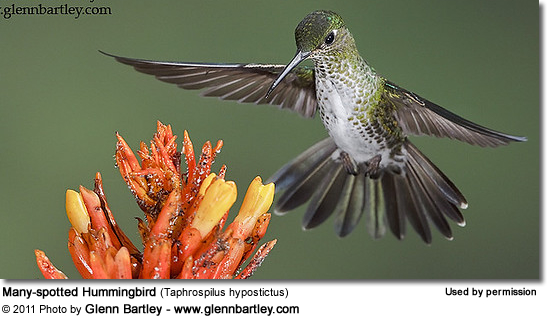 The Sword-billed Hummingbirds have the longest bills, proportionate to size - which allows them to feed on deep flowers found in the Andes Mountains. Sicklebills have extremely down-curved bills that allow them to retrieve nectar from the curved corollas of flowers in the family Gesneriaceae. 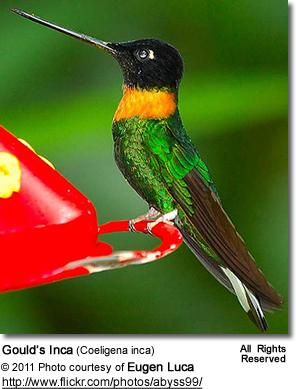 The Fiery-tailed Awlbill has a bill with an upturned tip and the male Tooth-billed Hummingbird has barracuda-like spikes at the tip of his long, straight bill. The top bill and the lower bill usually overlap, with the bill fitting tightly inside the upper bill. When hummingbirds feed on nectar, the bill is usually only opened slightly, allowing the tongue to dart out and into the interior of flowers. The tongue is grooved on the sides to allow them to easily collect the nectar. Plumage: The plumages of the various species vary from mostly green to mostly brownish (the hermits) - but all species have at least a few green feathers. Many species have brilliant iridescent markings (mostly the males). 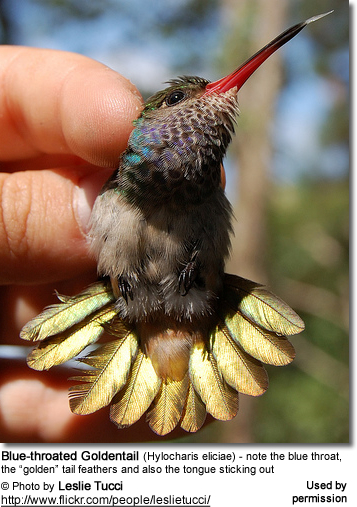 The iridescence is created by a light refraction from the prism-like cells on certain outer feathers. The light is split into varying wavelengths causing us to see varying colors at different angles and light conditions. Therefore, their plumage can look dull and dark from one angle and then brilliant and colorful from another. These iridescent feather patches look much more vivid than the colors of simply pigmented feathers. Hummingbirds can show off their colors (for example, to attract a prospective mate), or they can hide them by turning away from the light (to hide from predators). The White Hummingbirds / Albinos: Even though albinos are rare, a few of them are reported each year. True albinos have a completely white plumage, flesh-colored feet and bill, and red eyes. Other variations are leucistic forms or partial albinos, which may have some coloration on their plumage. Male or Female: Males are usually brightly colored. The females of most species are duller, which allows them to be camouflaged when nesting. Juveniles: Immature birds generally look like females. Some subtle differences may only be seen under close examination. Some juveniles (depending on the species) may have thin, tan or light grey edging to their outer feathers, which gives it a scaled appearance. The edging is particularly apparent on the head. Many immatures also have broken streaks of dark feathers on their plumage. As young males molt into adult plumage, more and more iridescent throat or crown feathers (depending on the species) can be seen. Juveniles have yellow markings inside the mouth, which can easily be seen if the bird's bill is open. These bright yellow markings actually help the female find the chick's mouth in the typically dark nesting area, so that they can more easily feed them. Really young chicks also have yellow "lips" for added visibility. Smallest Size Body: They are unique among birds because of their small size (2 - 20 g or 0.07 - 0.7 oz ), elevated average body temperature (~40° C or 104° F), and rapid heart rate (up to 1,260 beats per minute) (Johnsgard, 1983). Largest Sized Organs: They have the largest heart and the largest breast and flight muscles (30% of its total body mass) in proportion to body size than any other bird (Long, 1997). Weight: Their flight feathers make up about 30% of its total weight. Brainy Birds: A hummingbird's brain makes up about 4.2% of its total body weight - the largest proportion in the bird world. Considering that these amazing creatures find their favorite flower patches and feeders year-after-year, after traveling over 2,000 miles (3,200 km) to and from their winter and breeding territories (and along their migration routes!) proves that they are smart, too! Feet: Their feet are weak and are only used for perching and scratching the head. While most birds take off by leaping into the air by pushing away from their perch, the hummingbird lifts off by rapidly moving its wings. (Source: The International Wildlife Encyclopedia, 1969, Vol. 9, p. 1136). Tongue: Its tongue is grooved like the shape of a "W," with tiny hairs on the tip of the tongue to help lap up nectar with their tongues. Beak: The upper beak overlaps the edges of its lower bottom beak. Its lower beak is slightly flexible. 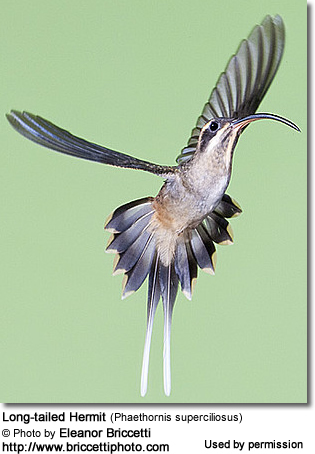 Feathers: An average-sized hummingbird has about 940 feathers. Smell: Hummingbirds (like other birds) have no sense of smell and many of their preferred flowers are not fragrant, unlike flowers favored by insects. Sight: They can see farther than humans, and they can see ultraviolet light. 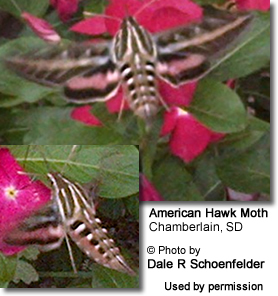 Particularly the smaller races are easily confused with insects - specifically with bees, or the hawk, clearwing or sphinx moths. 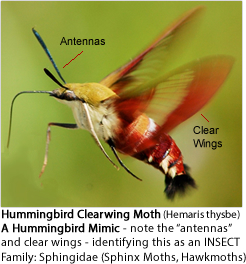 Adding to the confusion is the fact that these insects are often found in the hummingbirds' territory and have similar flying and feeding patterns. Moths have a couple of sensors or "antennas" on top of the head. 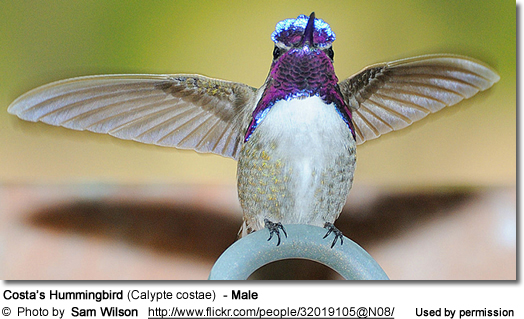 Provided you can get close enough to see them, this would be a good way of differentiating them from the hummingbirds. They may also have some yellow at the backend.